I have my first finished quilt for 2018! It was actually pieced last year, but I recently quilted it. 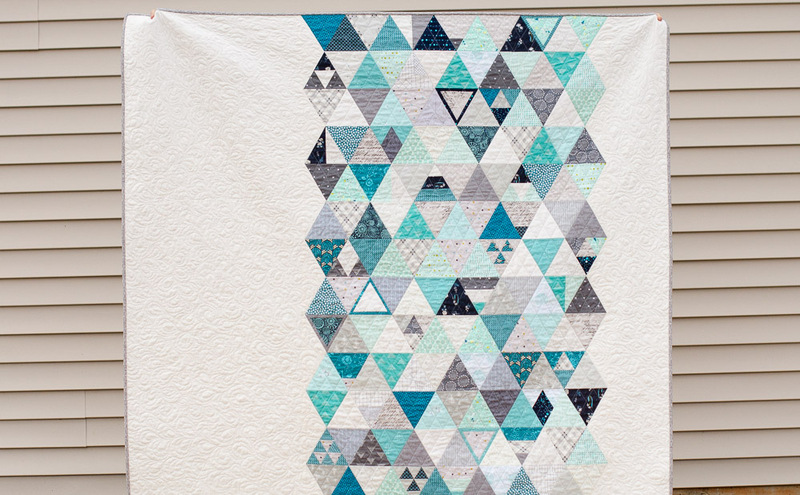 My quilt was inspired by the Quilt-Along on the Bernina blog hosted by Brigette from Zen Chic. It's a block of the month quilt, with a new pieced triangle pattern provided each month. They're currently up to block 10. 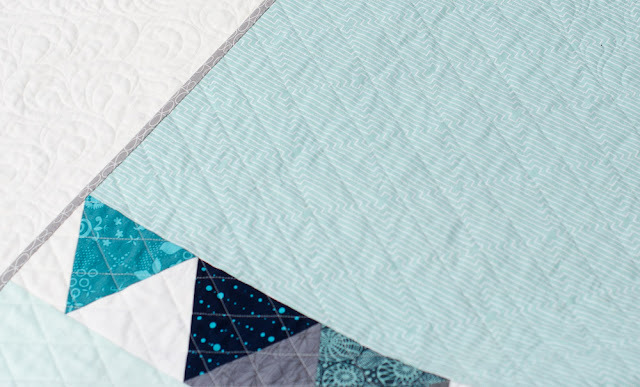 I decided not to make all of the blocks and just used the block designs as inspiration for several pieced 60 degree triangles in my quilt. I chose blues, aquas and grays - one of my favorite color combinations. My quilt is quilted with straight lines done with the walking foot in the pieced areas. The lines follow the seams to create a diamond grid. The white side borders were free-motion quilted with paisley type loops. 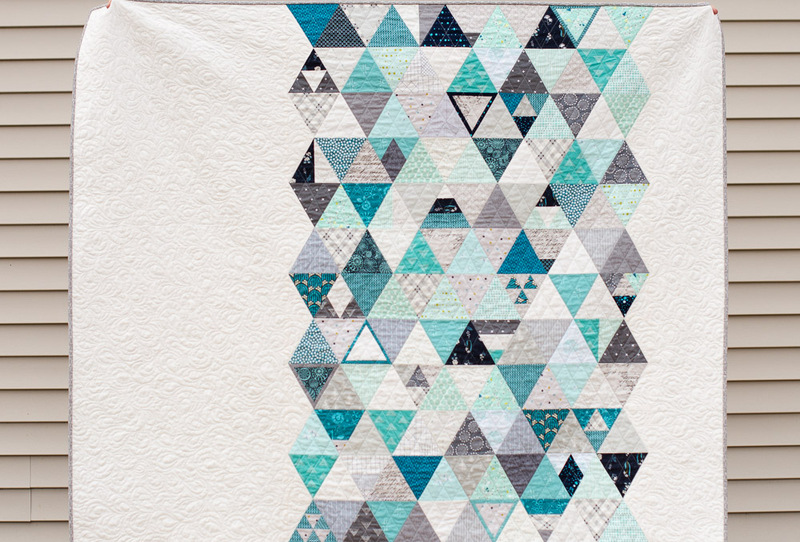 The backing has a few leftover triangles and some large pieces of aqua that I had in my stash. The binding is a perfect match of gray. This is probably one of the first quilts I've made with this much negative space. My husband asked if I had run out of patches and just got lazy! 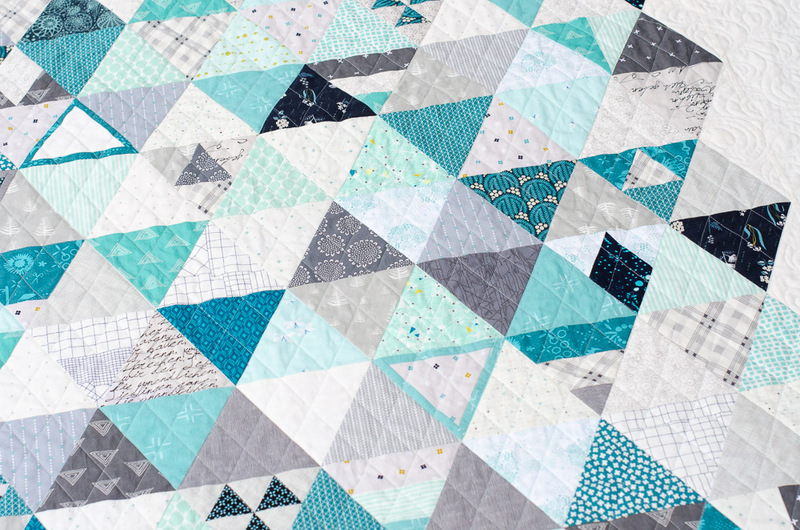 I really like the juxtaposition of the straight line quilting for the piecing and free motion quilting in the negative space! I can just hear my husband with the exact same question, although he would likely be aware it might not be a good one to ask out loud. I like this a lot. It shows those triangles off but still feels clean and modern. I think your colors are wonderful. All that white negative space makes the triangles the stars of the quilt. Husbands! Oh, my, they crack me up sometimes. Your quilt came out just lovely. I love the simple palette you used. I wish I was adept at combining fabric so effectively. I like it. Husbands are silly, aren't they? Your quilt is lovely - breezy and refreshing. Yeah, that sounds like something a DH would say. Thank goodness, we do need comic relief. I like the inclusion of a few pieced triangles along with the rest, as well as your color combo - really nice! Very cool, and I love what you did with the backing. The negative space is great. Husbands. They can be funny can't they? Tell your husband thanks for making me smile :) Hilarious! 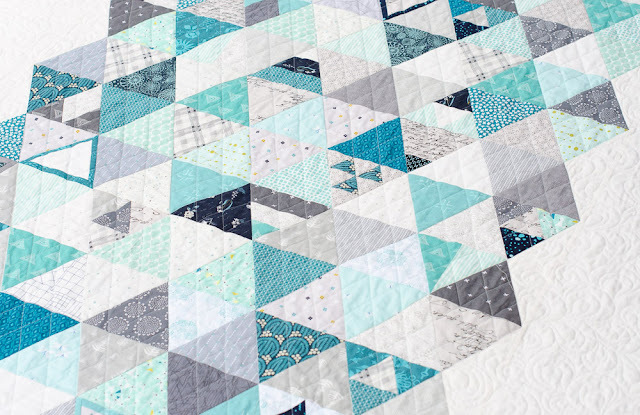 Lovely quilt, love the combination of straight line and FMQ and the color combination is great! 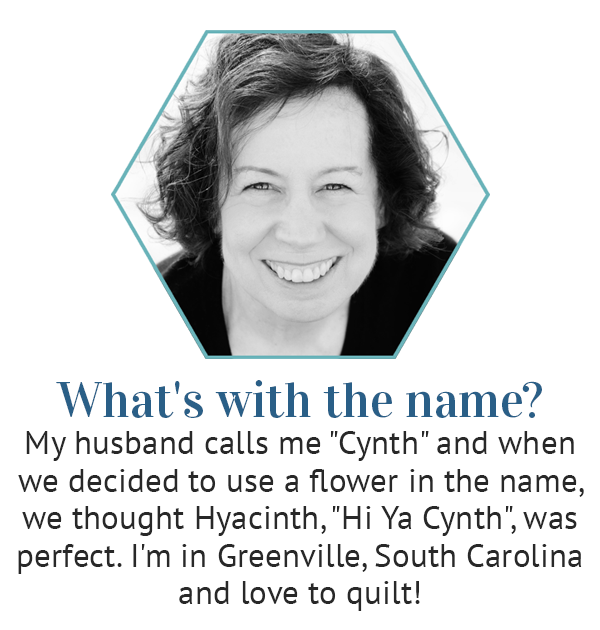 This is Danice, from Homespun Hannah's Blog. Such a pretty quilt Cindy. I love the negative space, as well as all of the color.